Many states have old, outdated laws on the books as lawyers in New Jersey can attest. While hundreds of new thousands of state and federal statutes are enacted every year, lawmakers are notoriously bad at spring cleaning, when it comes to outdated laws. 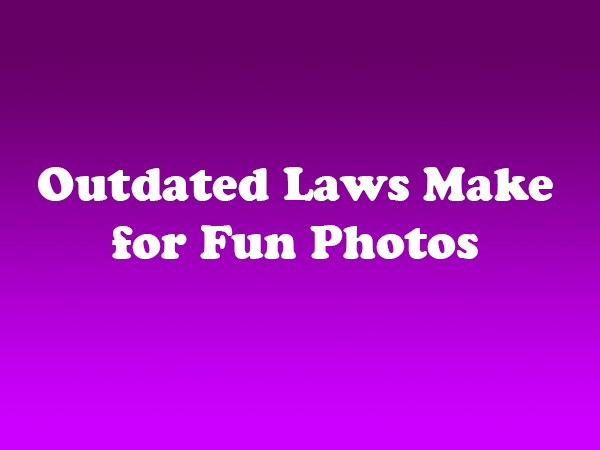 While clarifying and modernizing our statutes is serious work, photographer Olivia Locher reveals that it is also fun to celebrate their absurdity. She satirizes the most outlandish and outdated laws from across the country in an ongoing photo series, I Fought the Law. According to Locher, the idea for the series sprung from her discovery that it is illegal to have an ice cream cone in your pocket in Alabama. She started researching other antiquated statutes and found there was no shortage of examples. As part of the process, Locher researches the background of the laws by reviewing legal codes, public documents, and other sources. While some of the laws make sense, or at least did at the time they were enacted, others are downright bizarre. To turn the laws into art, Locher carefully creates the scene, often using models and props in her New York City studio. The images are modern, fun, and playful. The aforementioned ice cream law is depicted quite literally — a female model wearing a pair of white jeans is shown with a melting ice cream cone in her back pocket. Bryan Peterson Says You Can Improve Your Photo Skill in Just 4 Weeks, Believe It!